The fourth in our series Cobb County history through documents is the incorporation of Austell by an act of the Georgia legislature passed on September 4, 1885. The city limits of the town were a circle with a radius of one half mile from a railway terminal used by the Georgia Pacific Railway Company and the East Tennessee, Virginia and Georgia Railroad Company. If you’re interested in exploring more documents from Cobb County and Georgia history, this document was retrieved from the Georgia Legislative Documents database in GALILEO, available at the Cobb County Public Library website. 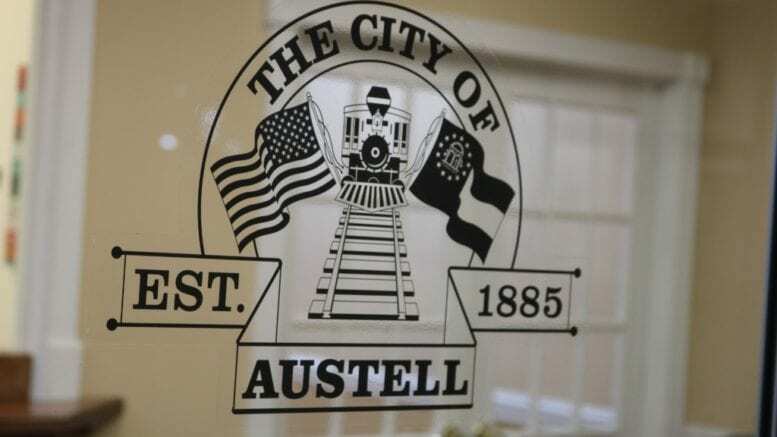 Short Title: INCORPORATING TOWN OF AUSTELL. Full Title: An Act to incorporate the town of Austell, in Cobb county, and to provide for the election of mayor and council, marshal and clerk, and to define their powers and duties. Section I. Be it enacted by the General Assembly of Georgia, and it is hereby enacted by the authority aforesaid, That from and after the passage of this Act, the town of Austell, in the county of Cobb, shall be incorporated under the name and style of the town of Austell, by which name it shall sue and be sued, plead and be impleaded. Sec. II. Be it further enacted by the authority aforesaid, That the corporate limits of said town shall be as follows: The corporate limits of said town shall extend one-half mile from the depot used by the Georgia Pacific Railway Company and the East Tennessee, Virginia and Georgia Railroad Company in said town, that is, said corporate limits shall commence at the centre of the depot aforesaid and extend one-half mile north, south, east and west, so as to include all of the territory in every direction within one half mile from the centre of the depot aforesaid, which, after the passage of this Act, shall be known as the corporate limits of said town; Provided, always, that no part of the county of Douglas shall be embraced or included within the corporate limits of said town, but the said town shall be confined wholly to and be within the limits of the county of Cobb. Sec. III. Be it further enacted by the authority aforesaid, That within thirty days after the passage of this Act, or so soon thereafter as practicable, and on every first Monday in January thereafter, there shall be an election held for the election of a mayor and five councilmen, which election shall be conducted in the same manner as an election for members of the General Assembly in this State, and each person residing within the corporate limits of said town who shall be qualified to vote for members of the General Assembly shall be a qualified voter in such elections for mayor and councilmen, and the person or persons who shall receive the highest number of votes for either of the above named offices shall be declared duly elected; Provided, that the marshal and clerk herein provided for shall be elected by the council immediately upon their election, or as soon thereafter as practicable. Page: 362in lieu of working on such streets; Provided, that nothing in this Act shall be construed so as to give the mayor and councilmen of the town of Austell any authority to levy a tax on land within said corporate limits which is used for agricultural purposes, except not more than one acre immediately around any dwelling house that may be situated on such land. Said mayor and council shall have power to make and establish any and all such by-laws, rules and ordinances as they may deem necessary for the government of said town which are not inconsistent with the laws and constitution of this State; to punish by fine or imprisonment, or both, in the discretion of the mayor or council; Provided, the fine shall not exceed fifty dollars nor the imprisonment thirty days, in the discretion of the mayor and council. Sec. V. Be it further enacted by the authority aforesaid, That the mayor or any member of the council shall have the same jurisdiction and authority, as have Justices of the Peace in this State, to bind over offenders that may be brought before the mayor or any member of the council, when it shall appear that the offense is a violation of any State law committed within the corporate limits of said town. Sec. VI. Be it further enacted by the authority aforesaid, That nothing in this Act shall be so construed as to give the town authorities, or any other authorities, the right to grant license to sell intoxicating liquors in any quantity within said town limits, or to repeal existing laws on that subject. Sec. VII. Be it further enacted by the authority aforesaid, That all laws and parts of laws in conflict with this Act be, and the same are hereby repealed. Approval Date: Approved September 4, 1885. Be the first to comment on "Incorporation of Austell Georgia — September 1885"